More than three years after its launch was delayed by a corporate merger, a commercial Earth-imaging satellite has finally shipped to its California rocket base for liftoff aboard an Atlas 5 in September. 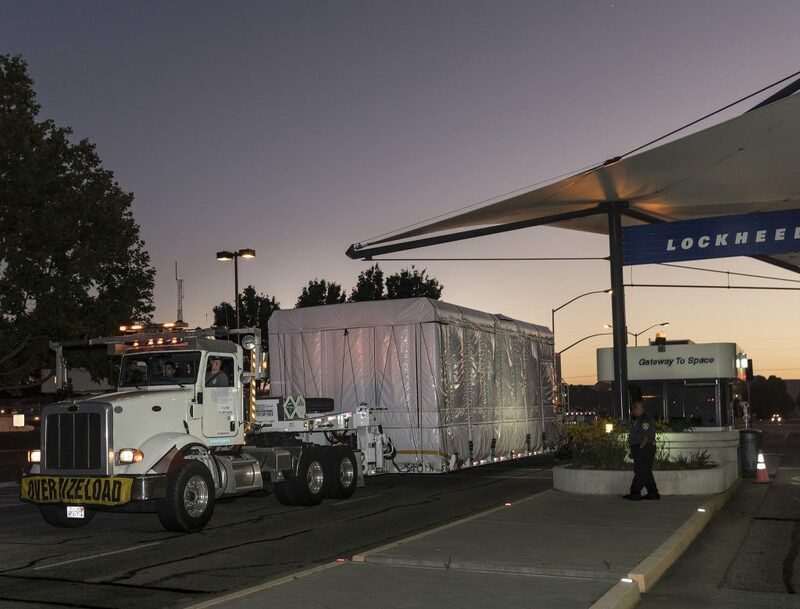 The WorldView 4 spacecraft, built by Lockheed Martin, was moved this week from its factory in Sunnyvale to Vandenberg Air Force Base located a few hours to the south. Liftoff of the United Launch Alliance Atlas 5 rocket is planned for Sept. 15 at 11:30 a.m. local (2:30 p.m. EDT; 1830 GMT) from the SLC-3E pad on South Base. The day’s launch window will remain open for 14 minutes. Operated by DigitalGlobe of Westminster, Colorado, the sharp-eyed satellite will circle 383 miles above the Earth in polar orbit and snap high-resolution pictures of the world below for customers including the U.S. government, agriculture, oil and gas, scientific researchers and land developers. But the launch has been on hold for over three years, delaying the original deployment date planned for the spring of 2013. That’s because former competitors GeoEye and DigitalGlobe merged their operations and independent fleets of imaging satellites into one company. 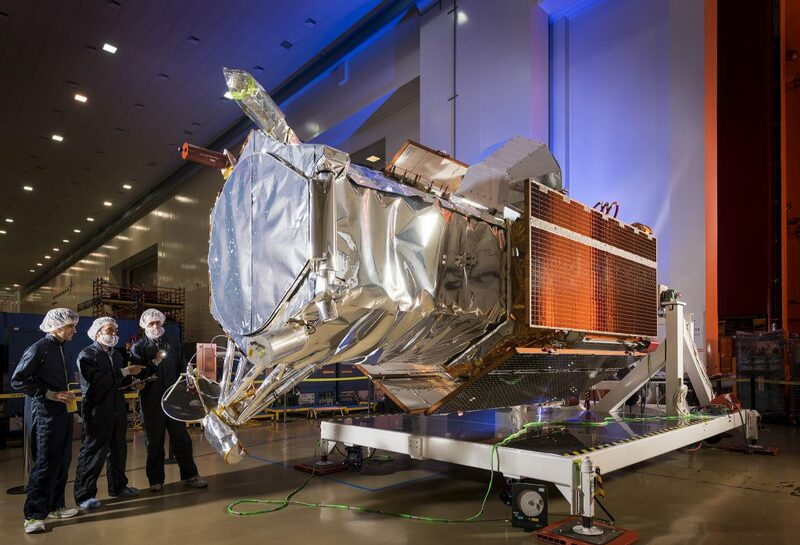 While both firms were developing state-of-the-art satellites for launch before the corporate marriage, the new company opted to launch DigitalGlobe’s WorldView 3 satellite first since it also provided multiple short-wave infrared bands that could penetrate haze, fog, dust, smoke and other air-born particulates. That left GeoEye’s bird on the ground to await market demand for its launching to effectively double DigitalGlobe’s high-resolution imagery collection capacity. The craft, originally built under the name GeoEye 2, was renamed WorldView 4 after the merger. “WorldView 4 will help us continue to transform the way we see the world, and advance our mission of keeping our planet and its people safe and secure,” said Dr. Walter Scott, founder and chief technology officer of DigitalGlobe. WorldView 4 is designed to see objects as small as 1-foot-wide (31 cm) in panchromatic mode and has a 4-foot resolution (1.24 m) in color. 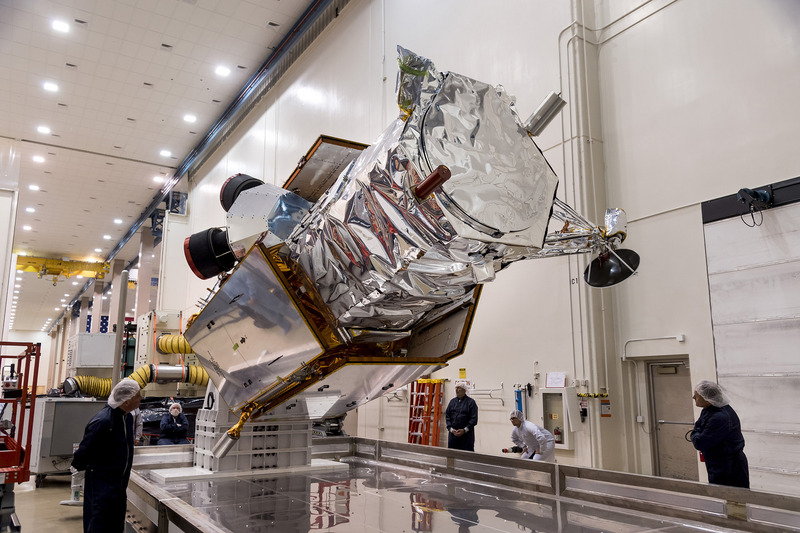 It will image 263,000 square miles (680,000 square km) of the Earth’s surface per day, doubling the capacity of WorldView 3 now in service providing the same quality high-res data. “DigitalGlobe’s smart imagery serves hundreds of thousands of end-users charged with the safety and security of nations, and enables the maps and geospatial applications relied on by billions of consumers,” said Carl Marchetto, vice president and general manager of Lockheed Martin Commercial Space. 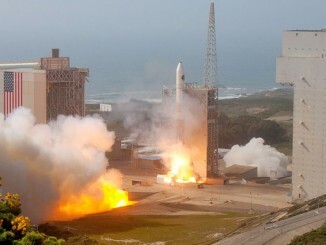 WorldView 3 was launched on Aug. 13, 2014 from Vandenberg aboard another Atlas 5. The WorldView 4 spacecraft will launch aboard the Atlas 5 originally built to send NASA’s InSight lander to Mars earlier this year. The vehicle, designated AV-062, was stacked on the pad awaiting that mission when an instrument problem delayed the launch until 2018, when Earth is again in alignment with the red planet. Since both InSight and WorldView 4 are using the same rocket configuration — a 401 variant with no solid motors — the passengers could be easily swapped. After WorldView 4 came out of lengthy storage, Lockheed Martin technicians completed health checks of major systems and tested image collection and downlinking capabilities. It was trucked by road to Vandenberg on Monday, July 24. 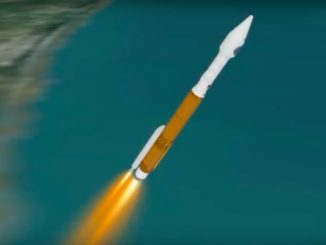 The launch site processing activities will include a final round of testing, the loading of 1,000 pounds of orbital maneuvering propellant and encapsulation within the rocket’s 14-foot-diameter nose cone before delivery to the pad in early September for mating to the rocket. 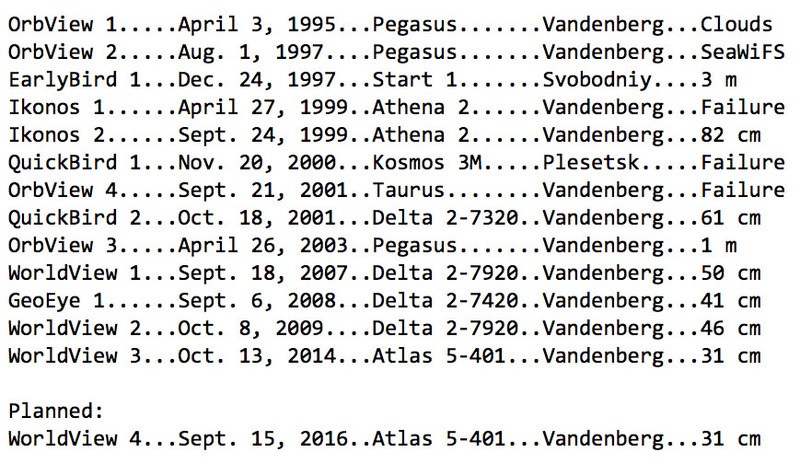 In addition to WorldView 4, the rocket also carries a box of seven cubesats to be deployed into a different orbit from the primary payload. The tiny hitchhikers are being launched from Centaur’s Aft Bulkhead Carrier. 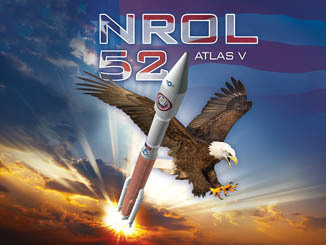 It will mark the 15th commercial mission for the Atlas 5 and the rocket’s 12th launch from Vandenberg. The launcher has flown 64 times to date. It has one flight, from Cape Canaveral, lined up before WorldView 4 to launch NASA’s OSIRIS-REx asteroid sample return mission on Sept. 8.